This is going to be a challenging sell for Sony. It’s pretty darn rare a film’s ending is known by 99.9% of the audience, save the .1% that makes its home in a cave or is believed to be holed up in one. Yes, Osama bin Laden gets whacked at the close of Zero Dark Thirty, but Kathryn Bigelow’s non-fiction thriller is not solely the final act of putting the terror mastermind down, it's the totality of the labyrinthine trail that ended with bin Laden's eradication – unabridged edition. And while it's executed with the same level of meticulous precision as the raid itself, you can't help but wonder if Bigelow could have compressed things just a bit. Opening in black with a 9-1-1 revisiting of the horror of 9/11, Zero Dark Thirty quickly hits its most powerful moments, taking place in Pakistan, inside an interrogation room. A merciless CIA agent (an Oscar-caliber Jason Clarke, stealing every scene he's in) beating, stripping and waterboarding a detainee, Ammar, who may - or may not - have info on where bin Laden is hiding out. Watching the waterboarding - the enhanced interrogation tactics - is rough when you consider the inside access into CIA operations Bigelow reportedly received. It's likely identical to witnessing the actual procedure occur. The process is hard to stomach for the latest CIA op on the scene, Maya (a riveting Jessica Chastain), the rottweiler-willed agent fiercely resolved to bring bin Laden to justice. Interrogation after interrogation, waterboarding after waterboarding, the intel all points to bin Laden's courier, Abu Ahmed al Kuwaiti, as the guy closest to al Qaeda's head honcho and the key figure to taking him down. With a strong assist from Maya's dogged determination, we finally arrive at zero dark thirty (military code for half past midnight) and the raid itself – it's 45 minutes of scintillating cinema if visually flawed. 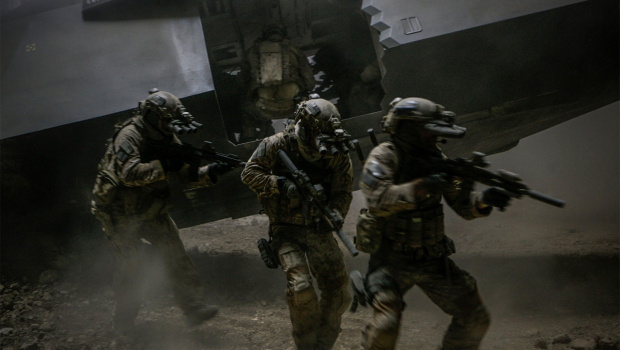 Bigelow was hamstrung by a rather substantial obstacle: the mission took place in the midst of a "moonless" night – not ideal conditions for filmmaking. It leads to a dingy look on film – it's often difficult to make out what exactly is happening as SEAL Team Six goes room by room, capping anything that moves inside the down-to-the-smallest-detail reconstruction of bin Laden's Abbattabad compound. But amazingly, even with the known outcome, Bigelow keeps an ample dose of suspense in play throughout the oft-scintillating - if semi-obscured - sequence. Was there a tad too much access given by the CIA to the filmmakers? How big a role did waterboarding play in bin Laden's demise? There's going to be endless debate about whether Bigelow does - or does not - "glorify" waterboarding – I'll save the politics for the 77,896 pieces (and counting) written about that particular debate. This take on Zero Dark Thirty is wholly about the moviegoing experience and as such, props are deserved for Bigelow. She's skillfully produced a comprehensive and compelling account of the mission to wipe the man responsible for America's darkest hour off the face of the planet.